The Kyo-Zukashi-Tsuba means openworked sword guards which were made in Yamashiro Province (present Kyoto Prefecture). Heianjo is a synonym of Kyoto. So, the Heianjo-Sukashi-Tsuba is used as a synonym of Kyo-Zukashi-Tsuba. 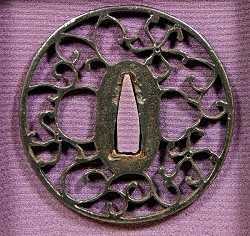 The Owari-Zukashi-Tsuba is a similar to the Kyo-Zukashi. Although, the features of Owari-Zukashi are that they are well-stacked and chuff, however, the features of Kyo-Zukashi are that they are graceful and sophisticated. 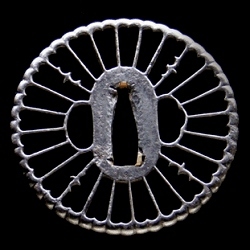 Kyo-Zukashi-Tsuba, they are made from well forged iron plate (rather thin plate), openworked elaborately all around. In many cases, the rims of them are slender and orthogonal. Two Bitsu-Holes (Kozuka-Bitsu-Hole & Kougai-Bitsu-Hole) are openworked in proper forms. There is no inscribed Kyo-Zukashi-Tsuba.